May Day as Child Health Day holds within it the power of a great vision. Its goal is to focus the interest of the nation upon perfected childhood—with the hope of a start in life free, sound and richly potential for every child…. “The summer round-up, with the State Congress of Parents and Teachers and the State Bureau of Maternity and Infancy cooperating in Oklahoma City, Oklahoma. In The Goal of May Day, 1928. The American Child Health Association (ACHA)—an organization founded by Herbert Hoover in 1923 with the merging of the American Child Hygiene Association and the Child Health Organization—began Child Health Day in 1924. The ACHA was inspired by the success of National Baby Week, an observance that spread awareness of infant care to millions by 1919 (clearly, awareness days and weeks are not a new phenomenon).1,2 The ACHA was also motivated by Congressional inaction (also not a new phenomenon); President Wilson had called for a child health program in 1919, to no avail. Cover of The Goal of May Day, 1928. By 1928, when the ACHA released The Goal of May Day, the organization viewed May Day-Child Health Day as a time to celebrate the past year’s child welfare successes and plan for the year ahead. As the pamphlet emphasizes, May Day-Child Health Day activities occurred thanks to the efforts of community groups and local governments rather than through centralized ACHA planning, “each [group] coloring [May Day] with its own interpretation and using it according to its needs.”1 The Goal of May Day provides these organizations tips and lists of further resources to plan events and to improve child health year-round. 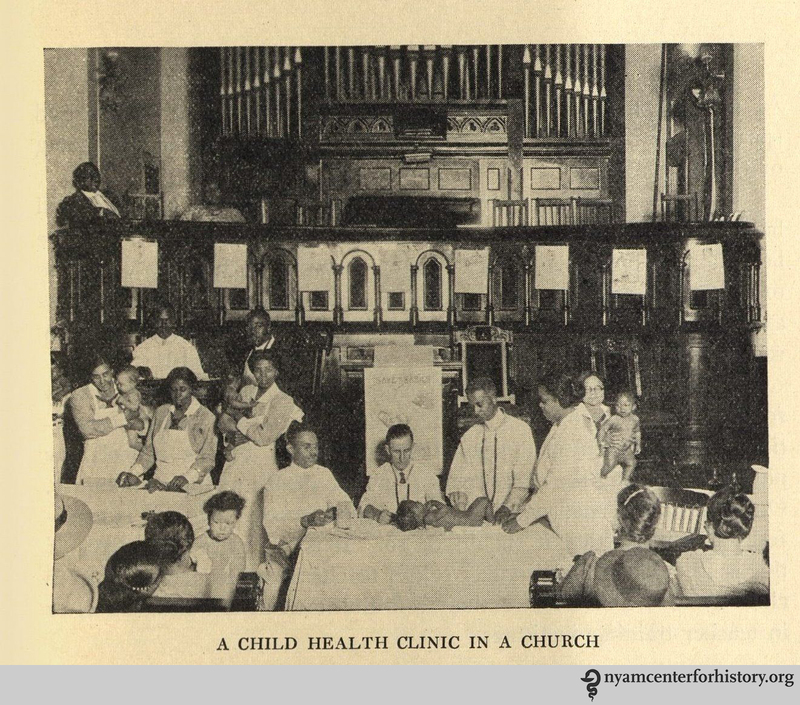 “A child health clinic in a church.” In The Goal of May Day, 1928. 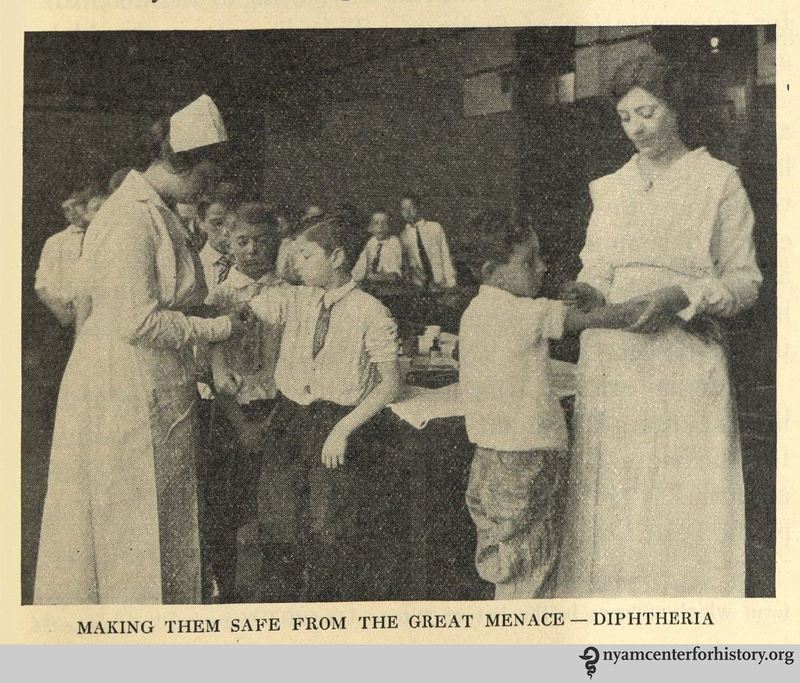 “Making them safe from the great menace – diphtheria.” In The Goal of May Day, 1928. 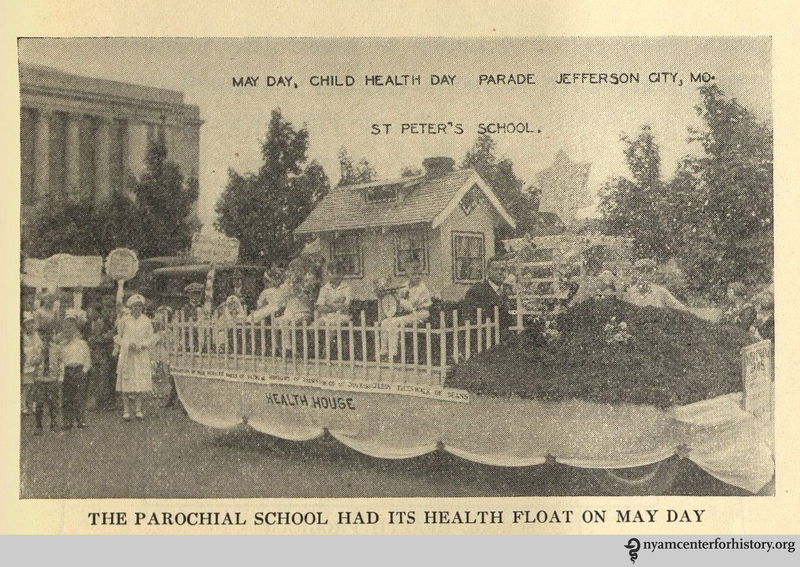 “The parochial school had its health float on May Day.” In The Goal of May Day, 1928. “4-H girls club learn from the home demonstration agents.” In The Goal of May Day, 1928. 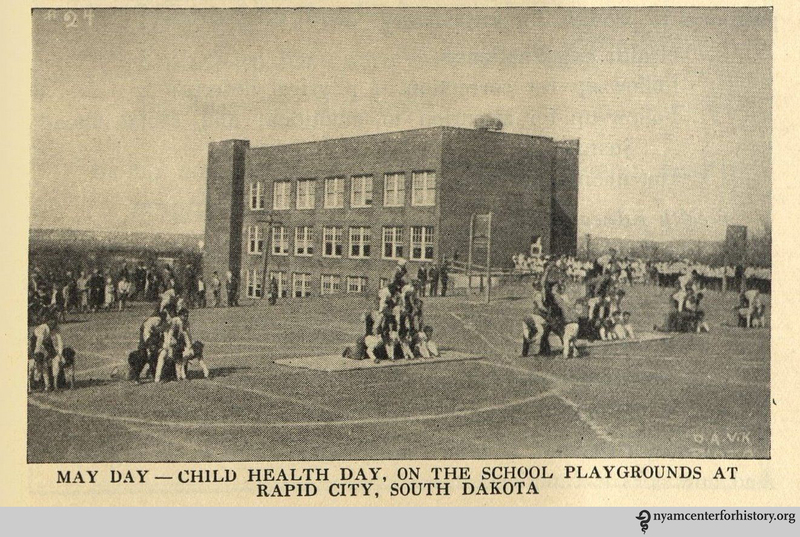 May Day – Child Health Day, on the school playgrounds at Rapid City, South Dakota. In The Goal of May Day, 1928. The American Child Health Association closed in 1935. During its 12 years of existence, it raised about $5 million for child-focused community services.2 And the observance of Child Health Day continues some 92 years after it began, though no longer around a Maypole. 1. The Goal of May Day: A Year-round Community Child Health Program. New York: American Child Health Association; 1928. 2. Lee RA. From Snake Oil to Medicine: Pioneering Public Health. Westport, Conn.: Greenwood Publishing Group; 2007. 3. Health Resources and Services Administration. Child Health Day History. Available at: http://mchb.hrsa.gov/childhealthday/history.html. Accessed April 27, 2016. 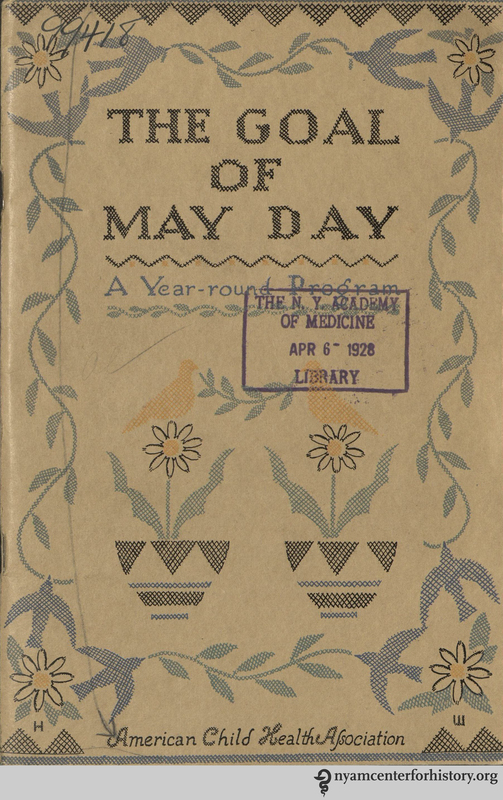 This entry was posted in Collections, History of medicine and tagged 20th-century medicine, American Child Health Association, child health, Child Health Day, health pamphlet, May Day, school health by nyamhistorymed. Bookmark the permalink.